The homecoming of a Shinkousen trading ship is enacted on Sunday afternoon. Yomitan Village is surrounded by sugar cane farms, rich nature and beautiful blue Ocean, and just perfect for the village’s big festival coming up starting Friday. A local official prepares to welcome the trading ship from its long trip to China. Yomitan, which is home to a few World Heritage sites like Zakimi Castle Ruins and Zanpa Cape, and also is known for its pottery and woven fabrics, is ready to welcome the island Friday, Saturday and Sunday for a special festival that has big name entertainers, plus the ship Shikousen. ‘Shikousen’ is a replica of the official ship used for trading and sending senior delegates to China in the Ryukyu Kingdom era. 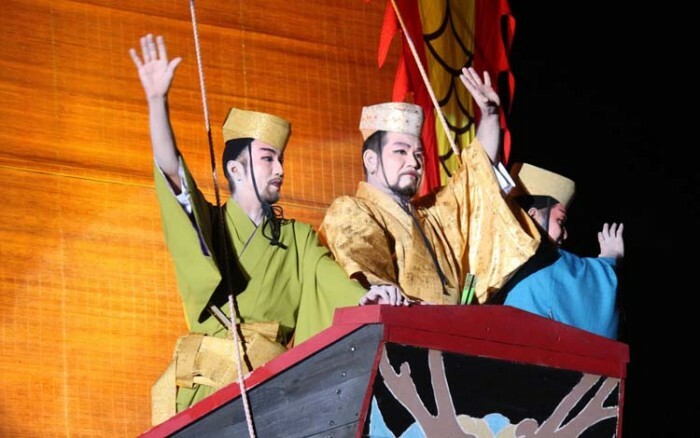 The Shikousen show gives people an idea how a ceremony went when the ship came back to Okinawa after a long trip. Yomitan is said to be the birthplace of Akainko, the earliest creator of Sanshin music. Akainko Ryukyu traditional classical music performances of about 300 players will be overwhelming. In addition, Yomitan is the most populous village in Japan. 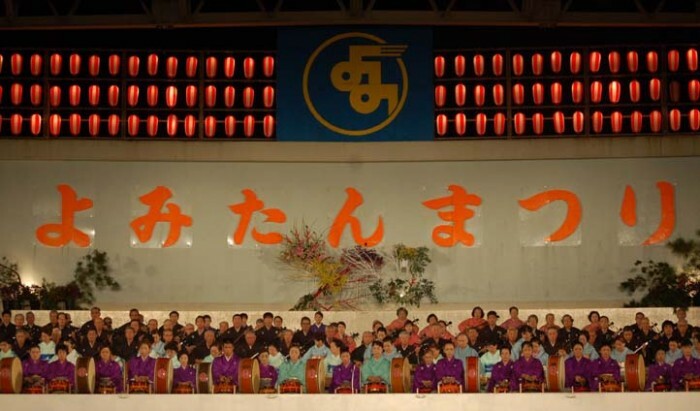 More good reasons for the village to host the Yomitan Festivan at the Yomitan Village Athletic Park are that local people from all over Yomitan will perform on various stages, showcasing Ryukyu classical music, dance, karate, and lion dance that will attract big crowds. Other than stage events, an exhibition and sale of Bonsai, farm products and famous woven fabric ‘Yuntanza- Hanaui’ will be held. At the Murasaki-mura, free bull fighting show will take place between 11 a.m. and 3 p.m. on Sunday. Music kicks off at 4:30 p.m. on Friday, with Okinawa superstars Diamantes and Kiroro on stage beginning at 7:15 p.m. Fireworks light up the Yomitan skyline at 9 p.m. Opening ceremonies Saturday are at 2 p.m. with the marching band Ryukyu-Zanpa Drums & Corps. 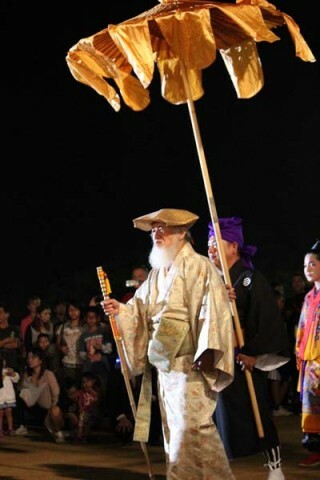 A group performance of five schools’ students from Yomitan Village takes place at 2:30 p.m., and Akainko Ryukyu traditional classical music performances are at 6:30 p.m. Fireworks again fill the sky at 8:30 p.m. The festival is open Sunday from 1 p.m. to 8:45 p.m., with traditional dance performances, including kids’ Bojutsu, at 2 p.m. The big ship Shinkousen show is at 5:30 p.m., and fireworks bring the Yomitan Festival to its conclusion at 8:45 pm. Some 300 players honor Akainko, the player and composer who wrote the first music for Okinawa’s favorite instrument.